Pre-primary or preschool education is targeted at children below the official primary school starting age. The content of national programs of pre-primary education varies, but the common goal is to introduce children to a school-type environment. Such programs set the foundation for lifelong learning and help countries reach the Millennium Development Goal of universal primary education. The Global Education Digest 2005 from UNESCO has statistics on participation in pre-primary education for the school year 2002/03. The net enrollment ratio (NER) is listed for 149 countries, the gross enrollment ratio (GER) for 180 countries. The NER is the share of children of preschool age who are enrolled in preschool. The GER is the number of children in preschool, regardless of age, divided by the population of preschool age. The maximum value for the NER is 100% while the GER can exceed 100%. In a previous post I demonstrated that the difference between NER and GER at the primary level can be quite large. This is often the case in Sub-Saharan Africa because of delayed entry into primary school. At the pre-primary level, the difference between NER and GER is much smaller, as a comparison of the two maps below shows. For most countries the pre-primary NER and GER lie in the same range although there are notable exceptions, among them Australia, South Korea, and the Ukraine. For this reason, and because the GER is available for more countries, I focus on the GER to describe participation at the pre-primary level of education. The lower graph presents the pre-primary GER in the school year 2002/03. The GER is above 80% in most industrialized countries, but also in some countries of East Asia (for example Malaysia and Thailand), Latin America (for example Cuba and Mexico), and Eastern Europe (Belarus and Russia). The pre-primary GER is lowest in Africa and the Middle East, with most countries in the range below 20%. Low GER values are also observed in Central, South, and East Asia. In Sub-Saharan Africa this pattern of low participation continues at the primary level, while in East Asia primary school enrollment rates are significantly higher. Friedrich Huebler, 25 July 2005, Creative Commons License. Not all children who attend primary school continue their education at the secondary level. At the global level, the secondary school net enrollment ratio (NER) is 59.3%, compared to a primary school NER of 83.8%, but primary and secondary school participation vary widely between individual countries. With data from the Global Education Digest 2005 by UNESCO the correlation between primary and secondary school enrollment can be analyzed. In the graph below, the primary school NER is plotted along the horizontal axis and the secondary school NER along the vertical axis. 151 countries are shown, with symbols that indicate the UNICEF region to which they belong. For the remaining countries the Global Education Digest contains no data on primary or secondary school enrollment. The secondary school NER does not increase proportionally with primary school enrollment. 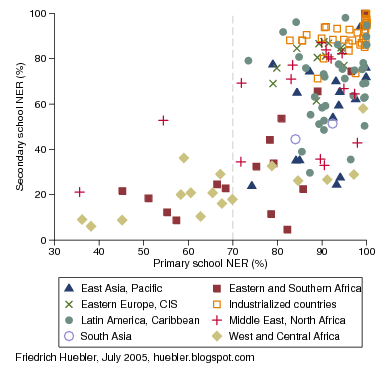 In 19 of the countries in the graph, the primary school NER is less than 70%; in 17 of these countries the secondary school NER does not rise above 30%. All countries in this group are from Africa or the Middle East. If the primary school NER in a country is above 70%, children are much more likely to continue their education at the secondary level. However, even in this group many countries, mostly from Africa, are struggling to raise secondary school enrollment. In the following table, all countries are grouped according to the primary school NER. For each group, the average secondary school NER and the number of countries in the group are listed. Secondary school enrollment does increase with primary school enrollment but for countries with a primary school NER above 70% this increase in secondary school enrollment is relatively steeper. In the 86 countries with a primary school NER above 90%, on average three out of four children of secondary school age (73.8%) go to secondary school. Note: Average values are weighted by each country's population of secondary school age.